Here's our latest ratings for Sunday, October 7th, 2007. Comparing Polls and Prediction Market data? 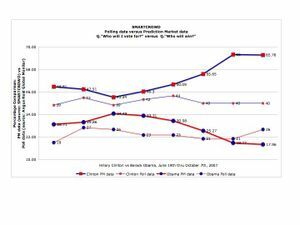 Here's a new chart comparing poll data against prediction market data for both Hillary Clinton and Barack Obama over a 3+ month period. Polling data, which is based on publicly information available at Angus Reid Global Monitor, is usually generated from the question "who will you vote for?" As such, polling is a % measurement of how respondents will vote, one way or another. The prediction market (PM) data, by stark contrast, is generated from traders who are each trying to answer the question "who do you think will win (and how certain are you of the outcome, based on a scale of 1-100)?" There are, of course, no surprises here in terms of leader or trailer. What is more interesting though is the correlation betwen poll data and PM data over time. We'll be taking a closer look at this over the coming months. Clearly, the media influences sentiment which in turn generates price changes in prediction markets. We'll be taking a closer look at this third data set, comparing it against poll data and PM data, over the coming months, to look for different correlations. As a teaser, we took a look at a couple of new sources of data. 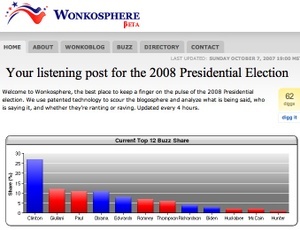 First, take a look at Wonkosphere which measures "buzz" in the blogosphere; good, bad and neutral. According to current data, Hillary Clinton is generating 25% of the buzz across the top 12 candidates, while Obama scores just under 10%. 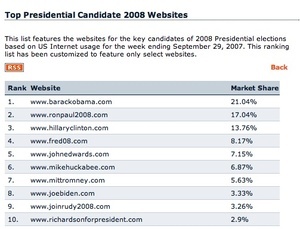 Second, take a look at Hitwise a website that monitors the traffic to different candidates sites. By this measurement, Obama has a clear lead. Through analysis like this we hope to produce some useful analytics! This weekend the FT ran Obama woos Iowa but Clinton surges, while the Economist ran the line The American presidency is Hillary Clinton's to lose. But that doesn't make her a shoo-in just yet. Right now, the polls, the prediction markets and the media all seem to be aligned in terms of how the Democratic nomination might unfold. Next week we'll take a look at the Republican data. 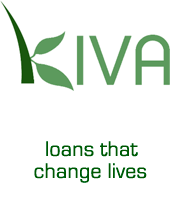 For the latest news on Election '08, click here.